Lisa Tremayne is one incredible maternal mental health advocate. After going through fertility issues and delivering triplets that had to be treated in the Neonatal Intensive Care Unit, Lisa suffered from postpartum depression and struggled herself to get help. Lisa, a registered nurse, was frustrated at the lack of help for women experiencing a maternal mental health disorder and began helping as many women as she could. Lisa went on to found the Center for Perinatal Mood and Anxiety Disorders at Monmouth Medical Center in Long Branch, New Jersey, “one of the few mother/baby programs for PMADs in the United States” according to the Bloom Foundation website. 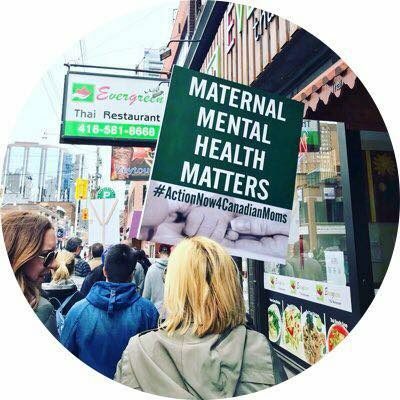 And, in response to a call from Canadian advocates recently to include maternal mental health as part of the conversation during Canada’s iconic Bell Let’s Talk annual mental health awareness campaign by using the hashtag #Bellletstalkmaternalmentalhealth, Lisa rallied her moms to help out. She creatively created “The Mask I Wore” photo campaign in which moms were asked to send in photos of themselves looking happy with their babies when in fact, they were suffering from a maternal mental health disorder. The photos were then shared using the #Bellletstalkmaternalmentalhealth hashtag in the U.S. and in Canada. By the end of the day, Lisa helped garner over 13 million impressions on Twitter.